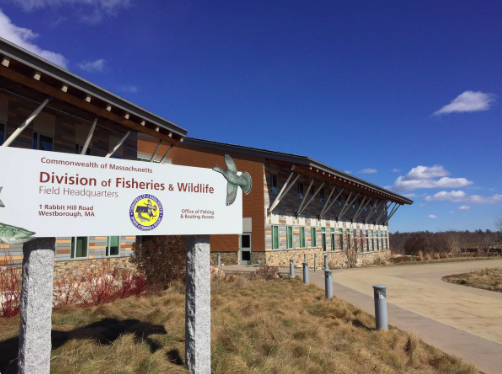 A 25-minute tour of the MassWildlife headquarters will be led by staff on October 4th. “The Massachusetts Division of Fisheries and Wildlife (MassWildlife) is responsible for the conservation – including restoration, protection, and management – of fish and wildlife resources for the benefit and enjoyment of the public. MassWildlife works to balance the needs of people and wildlife so wildlife will be available for everyone’s enjoyment today and for future generations. MassWildlife was founded as a state fisheries commission in 1866 in response to citizen concerns about the loss of Atlantic salmon to dams and pollution. The continuing development of the agency from that time until the present reflects the will of the citizens of Massachusetts to protect and restore our natural resources. The conservation – including protection, restoration, and management – of Massachusetts’ fauna and flora is the statutory responsibility of MassWildlife. Specifically, MassWildlife’s charge is the stewardship of all wild amphibians, reptiles, birds, mammals, and freshwater and diadromous fishes in the state, as well as endangered, threatened, and special concern species, including native wild plants and invertebrates. This responsibility is established and articulated in the Constitution and General Laws of Massachusetts. “Construction of a new 45,000 gross square foot Field Headquarters Building, including office, labs, meeting and classroom areas on the site of the former DFW headquarters building on the campus of the former Lyman School in Westborough, MA. The facility achieves zero net energy through solar photovoltaics and innovative mechanical systems as well as building envelope quality and reduction of all energy loads through building management. The building features a very efficient envelope with triple glazed curtainwall and metal windows as well as structural insulated panels. It has been oriented to optimize production from the rooftop photovoltaic panels while minimizing heating and cooling energy use. In 2016, the building received the Energy Efficiency, Green Building Market Leadership Award and the Green Building of the Year Special Merit Award. The American Council of Engineering Companies of Massachusetts (ACEC/MA) announced this project received Silver Award Recognition at their 2017 Engineering Excellence Awards Ceremony in Boston. The current energy model is calling for of 303 mwh/yr which equates to 22.6 kBtu/ft². Compared against the expected 370 mwh/yr production of the PV system, this is a projected 22% buffer between energy use and production and is approximately 60% below typical usage for this type of building. Leed modeling results suggest that the designed building will reduce actual energy cost by 50.1% compared to the Leed baseline building.